Custombuild for Crazyparts in Japan, the Greenguards are very close to org. old Nitrate Guards, available also new! 62' & 64' style, we also have very nice Parchment Guards 62', 64'/65', 68/69 Pearlback and 70's style and last but not least 1-Layer White, Parchment and Vintage White Guards. 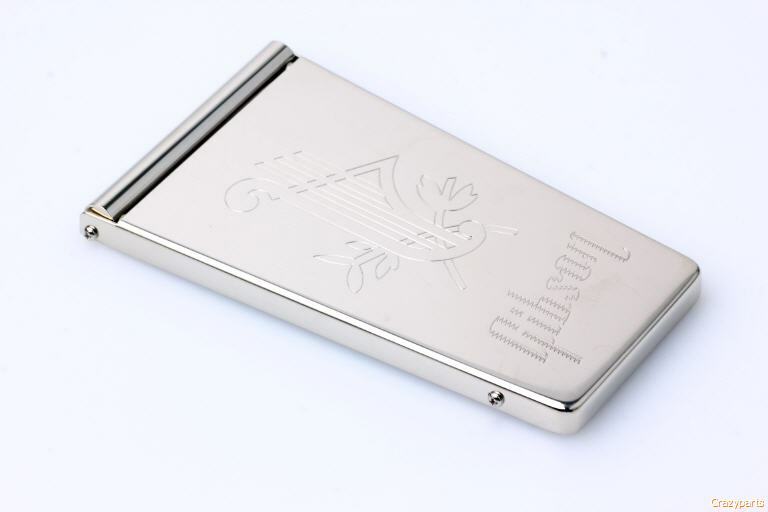 Also Guards for Tele, P & J-Bass® We also have Ltd. run of real Celluloid Guards...please ask! 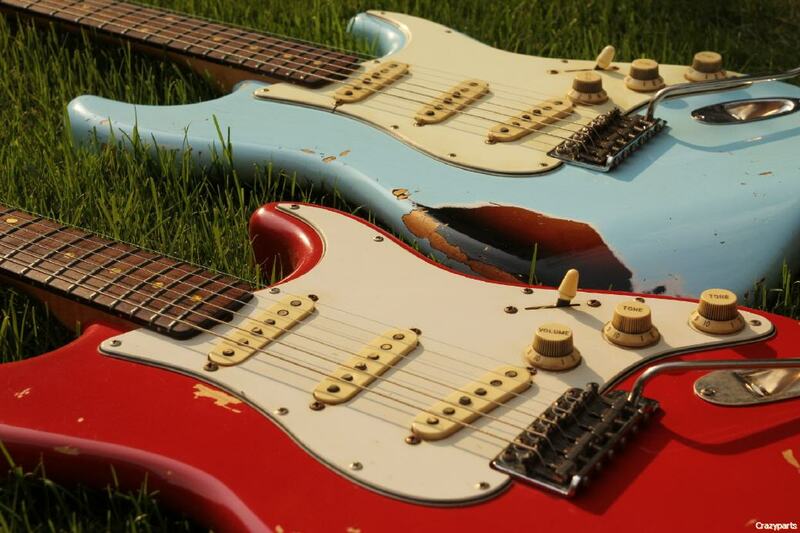 Distressed, Aged or Relic...name it yourself! 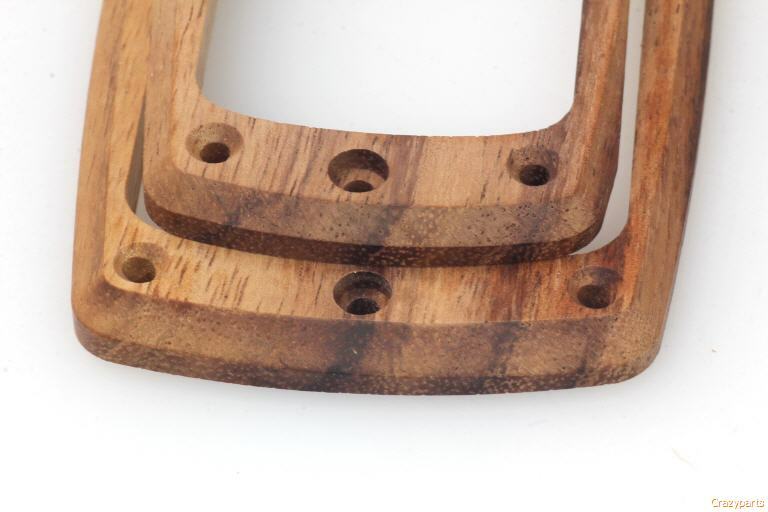 ...we started aging Guitarparts more then 20 years ago. 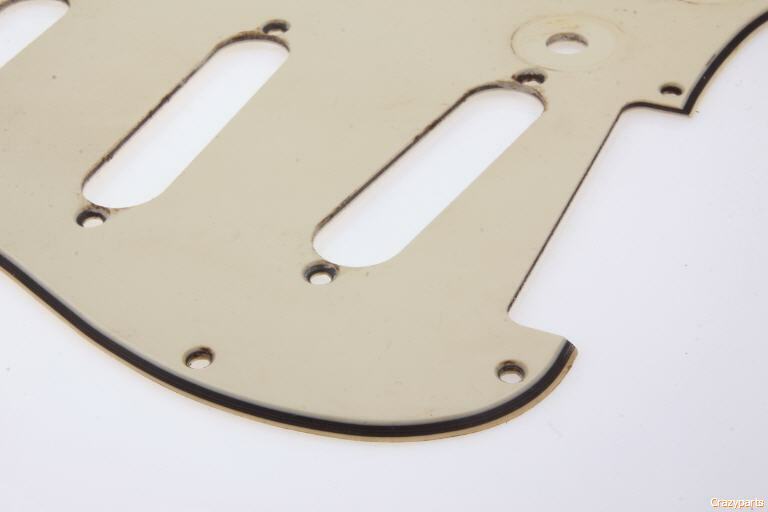 After years of research and experience in aging metal and platicparts we are proud to introduce our "Art of Aging" Series...High Quality Vintage related Aftermarket Parts...a huge selection of Metal and Plasticparts for Gibson and Fender style Guitars...our goal is to offer authentic looking aged parts for a reasonable price! Please note that we age parts one at a time painstaking and carefully by hand, in this way every single piece is unique. We at Crazyparts offer a wide range of different Color Plastics and we think you will find your favorite one here. 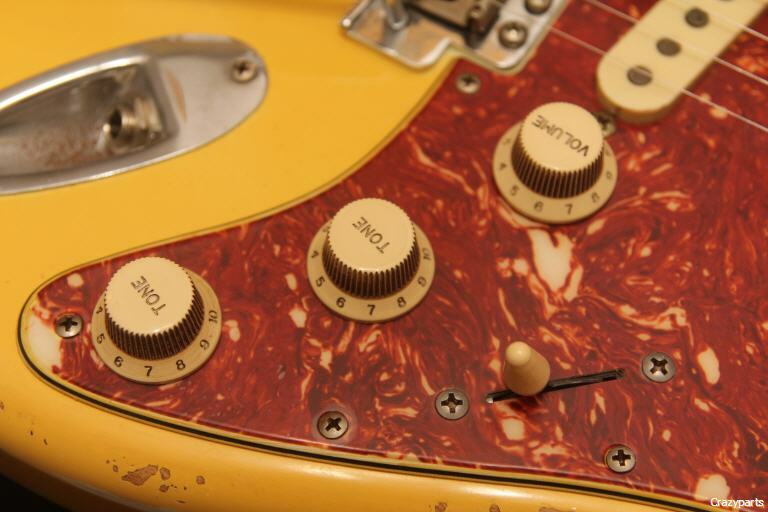 Over the years we find several suppliers which offers Pickguards, Rings, Knobs and Covers with Vintage Colors. 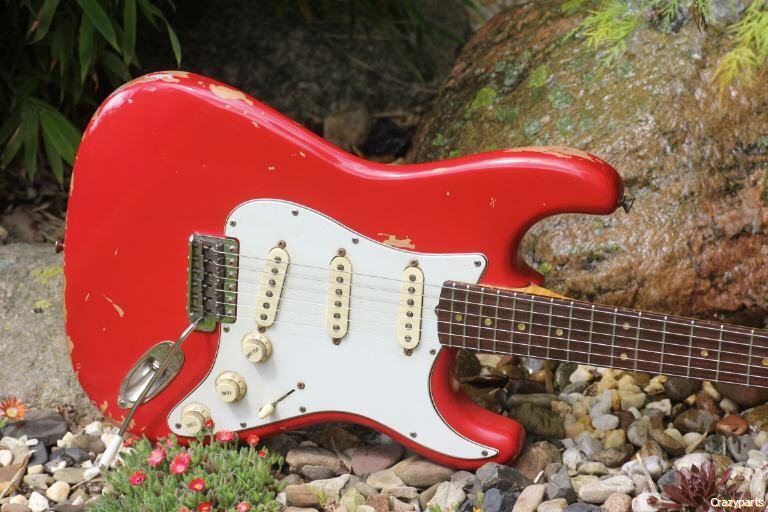 Gibson and Fender changed specs/colors over the years so we think its hard to say "This was the real color". 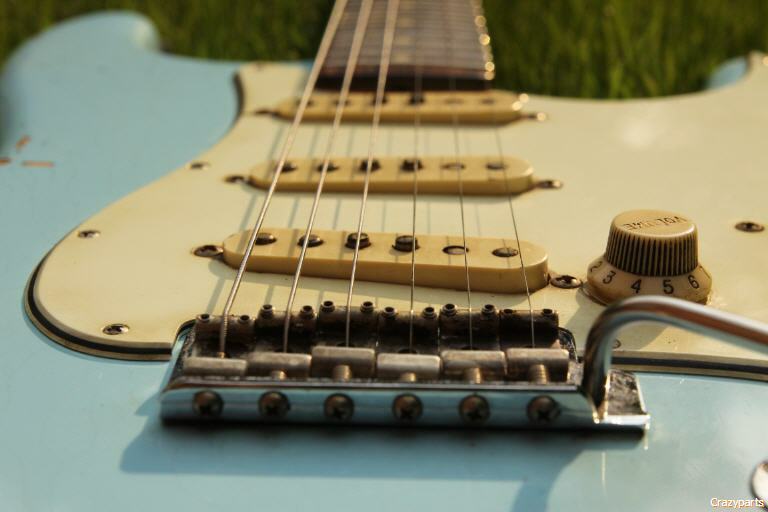 We have access to real Vintage Guitars and Parts and saw hundrets of real ones over the last 20 years, we are proud to say that lot of our parts are Customordered and matched close in color to ol' ones. Here is a nice example of our new Custommade real "Wide Bevel" Guard. Available in Greenish or Vintage Parchment, nice shiny surface, slightly screw pull, Scoop and dirt build up. Made from US template so will fit US/Mexican and vintage Strats.